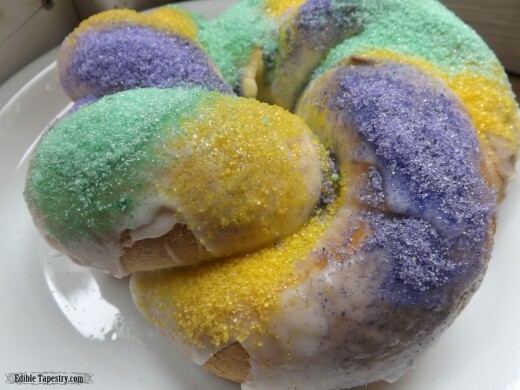 I’ve never been to New Orleans, or Louisiana, for that matter, but it’s still fun to share in the holidays that my family doesn’t feel a connection to with great food. 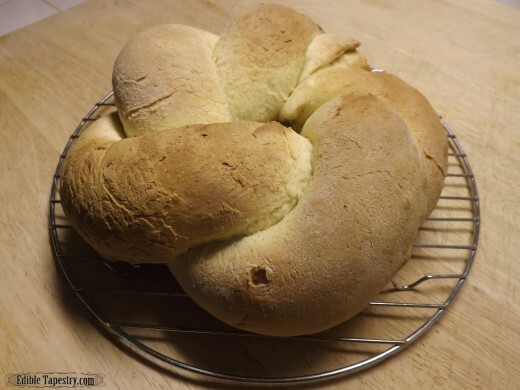 For Mardi Gras this year, I planned to make the Fat Tuesday Spicy Sausage Tomato Bisque that was the subject of my last post, but this morning I thought it would be fun to add a king cake to our menu. I got the yeast going before I was sure that I even had colored sugars to use to decorate the cake. As it turns out, I did not. 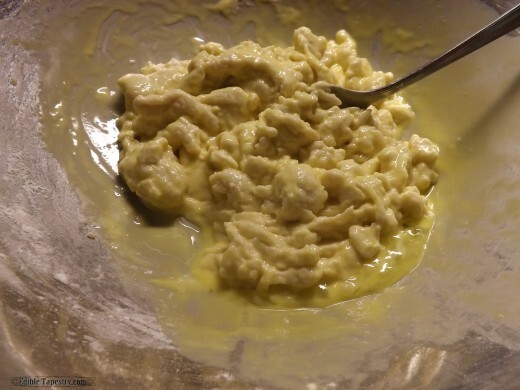 Within a few minutes, however, I had the sugars food colored to green and purple to go with the gold that I had left in the pantry from another project. Who knows how old that bottle was? It was most likely left from making one of the boys’ birthday cakes. But sugar is sugar and has an unending shelf life. 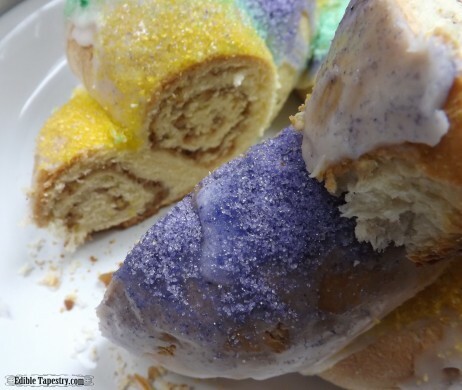 A king cake is made from a similar dough as a brioche. 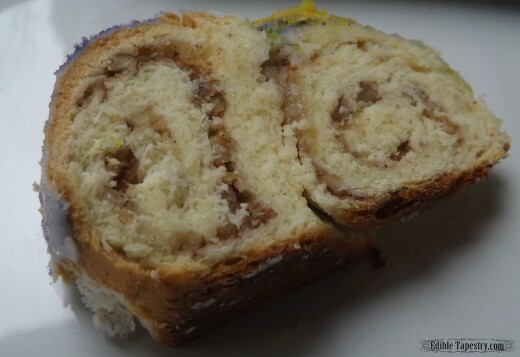 So is a German stollen, so I adapted and cut down my stollen recipe for the king cake, adding pecan filling for interest. 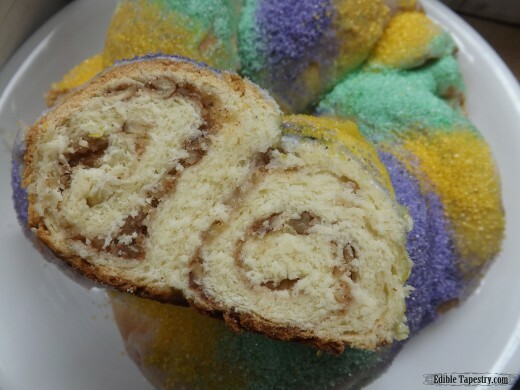 We didn’t have a plastic or porcelain baby to bake into it, as is customary for a Mardi Gras king cake, but I read that in other cultures coins or pecans could be hidden inside. 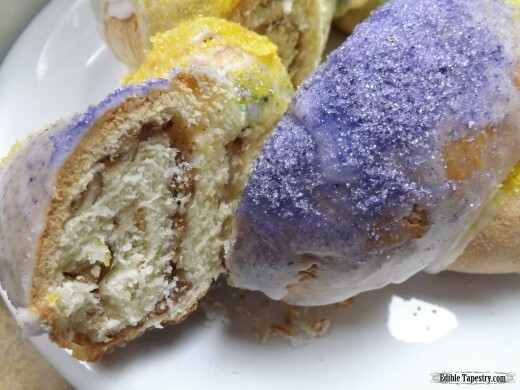 I decided that, since a pecan shell or hard coin would be unpleasant to bite into, I would use two shelled pecan halves stacked together as our king cake “prize”. 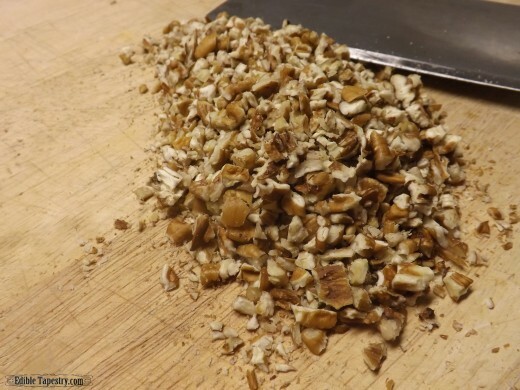 I don’t know what it means for the person who finds it in their piece of cake, I’ve had all day to decide but am out of ideas, so I guess they will just get a pecan in their cake. 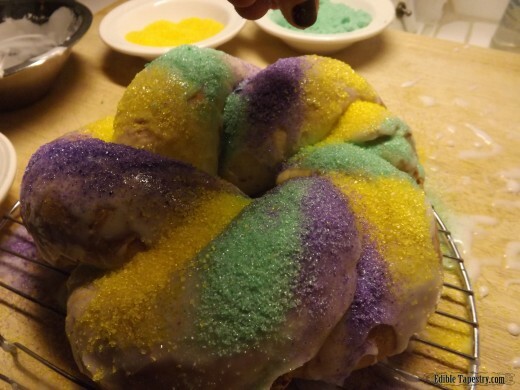 My recipe doesn’t make a very big cake, maybe 8″, so wouldn’t feed a real Mardi Gras crowd unless doubled or tripled, but makes the perfect size for my little family. 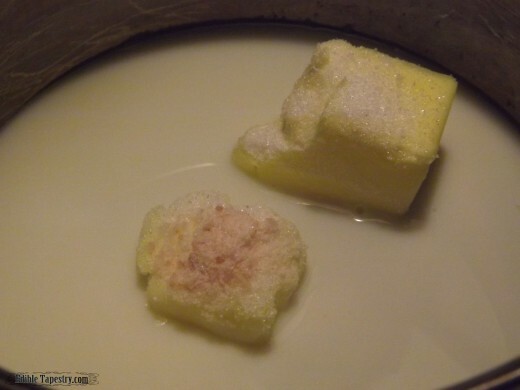 To make the dough, combine the milk, butter, sugar, and salt in a small saucepan. Heat just until the butter melts. 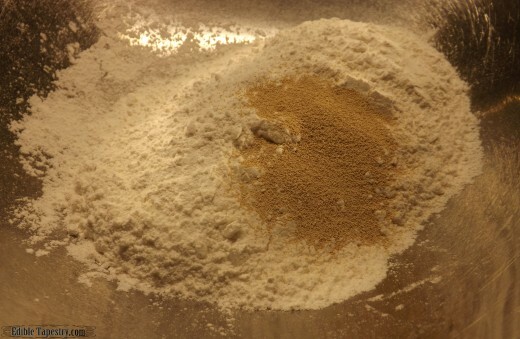 Sift together the yeast and 3 c. flour. 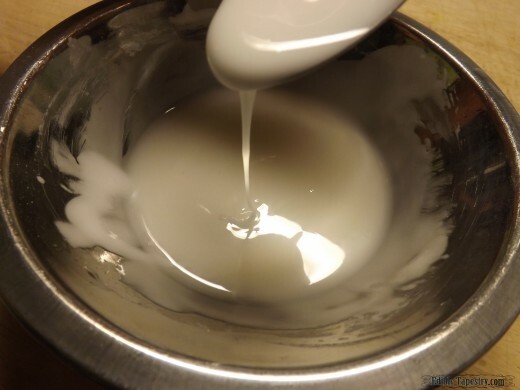 Mix together the milk mixture and the flour and yeast. Beat well to combine. 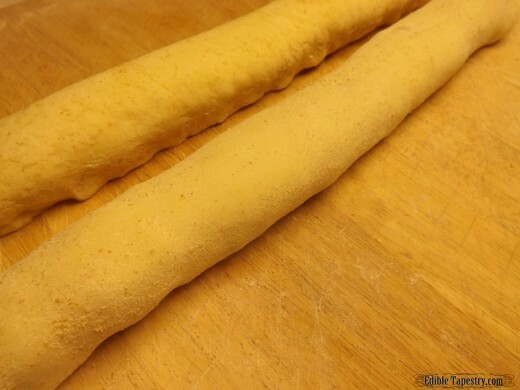 Stir in enough of the remaining 1 c. flour as possible before turning the dough onto a floured surface to knead in the rest. 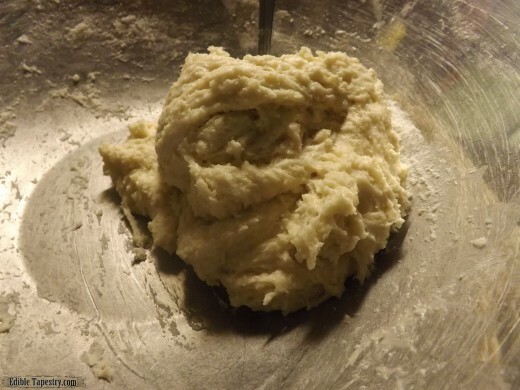 Knead 8 to 10 minutes, until dough is smooth and elastic. 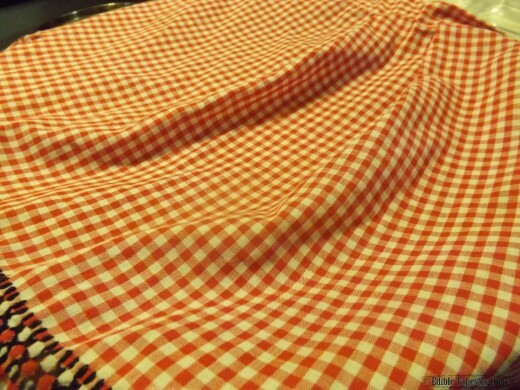 Place in a warm place to rise until doubled, covered. 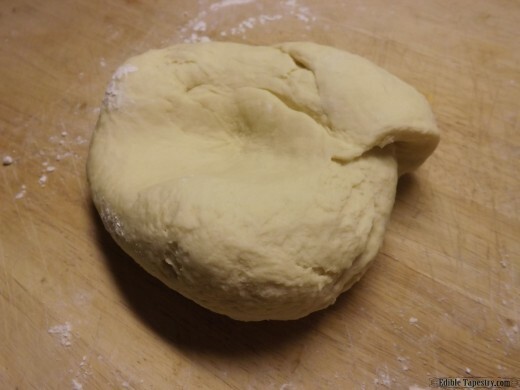 Combine the filling ingredients, all but the butter which will be spread across the dough. 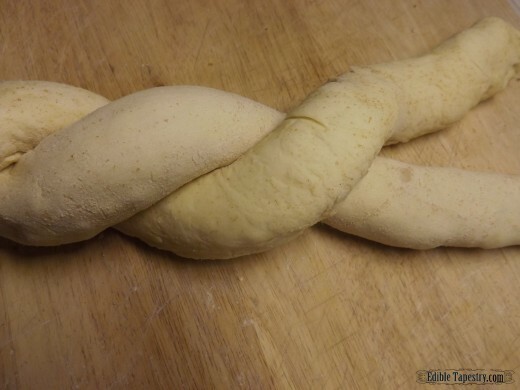 When the dough has risen, divide into two pieces. 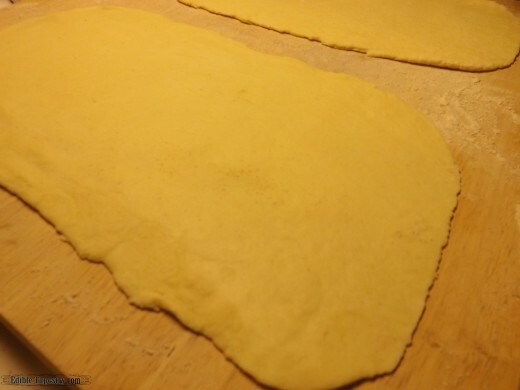 Roll each piece into a rectangular shape. 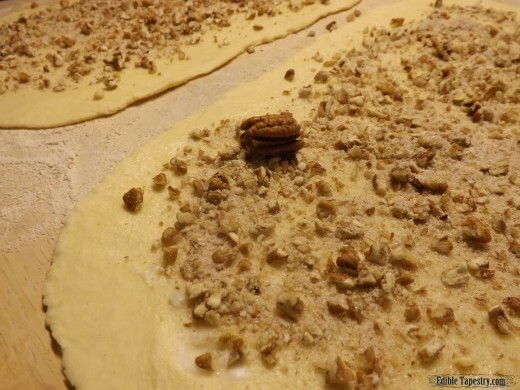 Spread butter onto each, then sprinkle with the pecan filling. Place the object that is to be hidden. Lay the logs side by side and begin twisting them together. 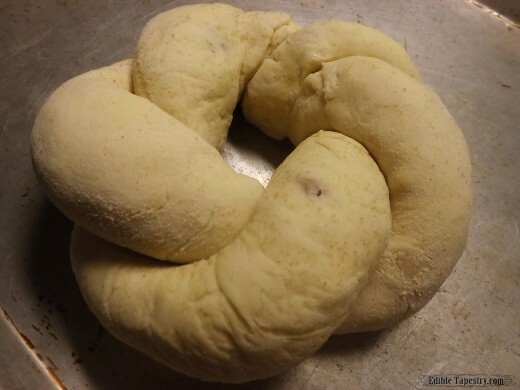 Bring the ends around together in a circle to seal, making a ring. Place on a greased sheet pan. Allow it to rise, covered, until doubled in size. 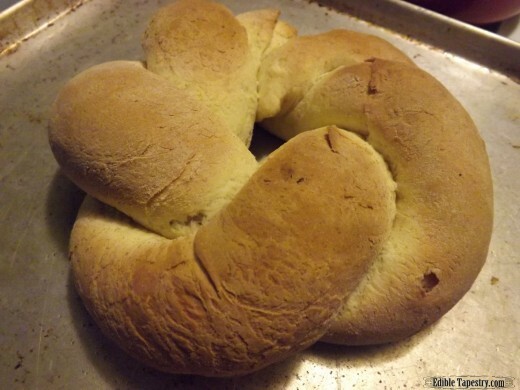 Bake app. 25 minutes, until golden brown. 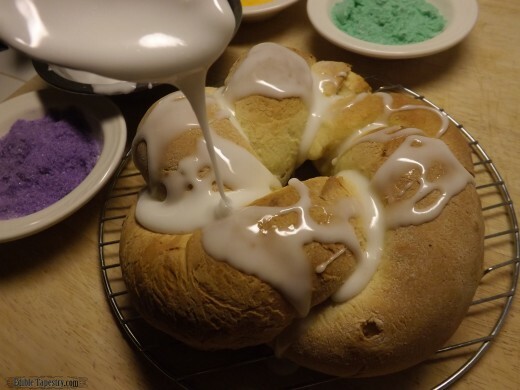 Make the glaze by adding enough water to the confectioner’s sugar to make it thick but runny. Drizzle glaze over the cooled cake. Sprinkle on the colored sugars. *There was a little goof with this recipe. I ran out of an ingredient and had to substitute another at the last minute. If you can spot the very obvious substitute that didn’t affect the outcome of the cake, but changed its appearance, let me know in a comment.